Split your Kaiser rolls in half horizontally. Pile a huge mound of pulled pork on the bottom half of the roll. 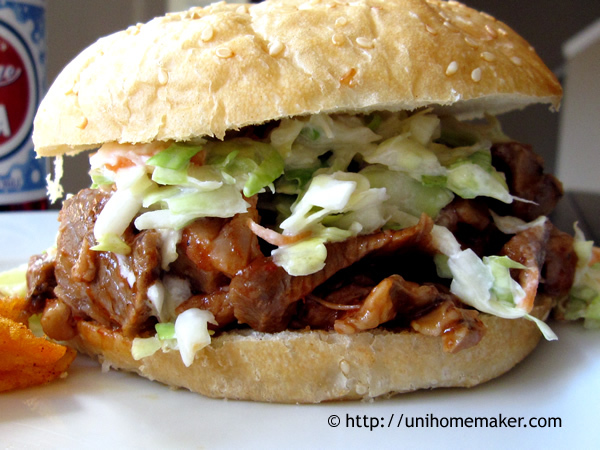 Top with a large spoonful of coleslaw and then place the top half of the bun on top. Serve with some potato chips, side salad, tater tots or French fries. -As good, I would’ve thought, as freshly grilled pork sandwiches I used to get in Portugal. Thanks Johnny! Yes, it is almost decadent! 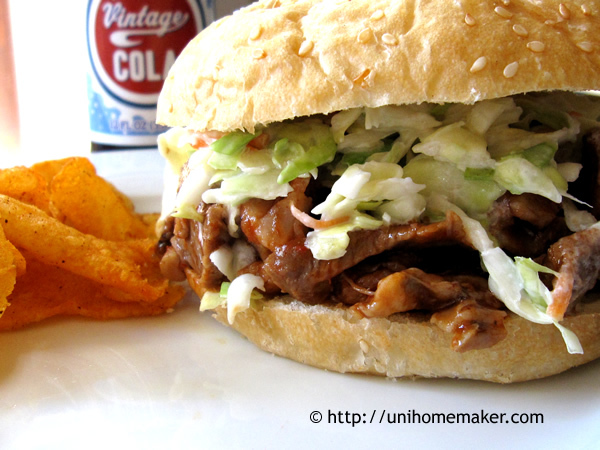 Love it, I have made pulled pork before and just adored the flavor. Your recipe makes me want to do it again! Your welcome. Keep the blog going and share all you have. Love the ideas! Thanks for the lovely comment Bobbi –always a good thing to hear. This looks absolutely delicious. I loved how you photographed it, Anne, showing how you built the layers. Now I have to have a look at your pulled pork recipe. This could be on the list for dinner next week! Thank you!! Thank you Allison. I never really cared for pulled pork sandwich before but this has changed my mind. Delicious and more delicious! I will definetely try it. Your pull pork sandwich looks delicious! Totally my kind of comfort food. The slaw on top must be wonderful too. 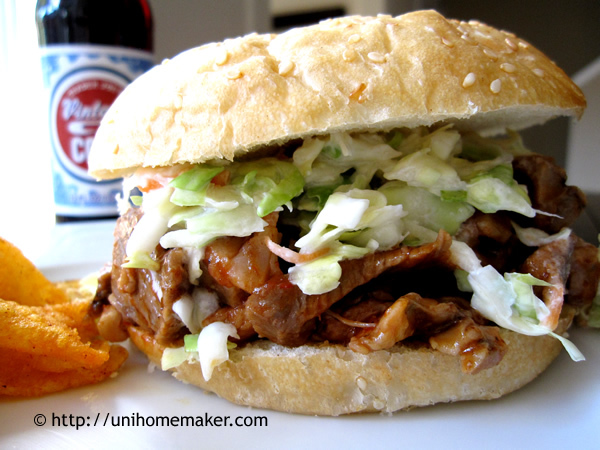 I love that crunch contrasting the soft pull pork and bun. 🙂 Drooling! Yummmmieee…it looks delicious!! !..Never throw away the food…and you do perfect Anne!!! Thanks Eva! I would rather use a leaner cut myself but since I have never done pulled pork before, I was worried about the outcome being too dry on a leaner cut of pork. So I went with a fattier cut. I’ll have to experiment with a leaner cut next time. I love love love pulled pork. This just reminds me to get a slab of pork shoulder and go at it. Beautiful sandwich! OMG! I just had lunch but you are making me hungry again Anne. It’s been so long I’ve had a good burger to go with fat creamy fries and lots of beer! Waw & now, the pulled pork sandiwch! It looks treally & truly remarkable & amazing too! I can’t wait to make your 2 tasty combined recipes!